EUMETSAT and ESA are enjoying the success of the Sentinel-3B's launch, from Plesetsk, Russia, which will establish the European backbone of a space-based, global ocean monitoring system at the service of operational oceanography. The spacecraft will form a two-satellite constellation with Sentinel-3A, launched in February 2016, that completes the full deployment of the Copernicus Sentinel-3 mission to offer marine data users the global and frequent observations they need to monitor and forecast the ocean. The dual-satellite Sentinel-3 mission is one of the six Sentinel missions deployed and exploited by ESA and EUMETSAT as the space component of the European Union’s flagship Copernicus Earth observation program. Under an agreement with the EU, EUMETSAT already performs flight operations of the Sentinel-3A satellite in cooperation with the European Space Agency (ESA). EUMETSAT also extracts marine products from the observations of the three instrument suites, the Ocean and Land Color Instrument (OLCI), the Sea and Land Surface Temperature Radiometer (SLSTR) and the Synthetic Aperture Radar Altimeter (SRAL) and distributes them in real-time, while ESA is responsible for land observations and products. 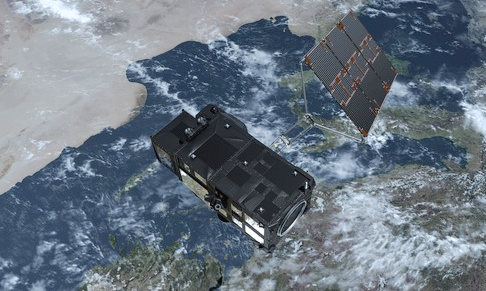 In addition, EUMETSAT exploits the Jason-3 high precision ocean altimeter mission in synergy with Sentinel-3A on behalf of the EU, in partnership with CNES, NOAA and NASA. After contributing to the new satellite commissioning led by the European Space Agency (ESA), EUMETSAT will take over the control of Sentinel-3B, perform flight operations of the Sentinel-3 two-satellite configuration from its Darmstadt headquarters and deliver two Sentinel-3 marine data streams. EUMETSAT Director-General Alain Ratier said that after the commissioning of Sentinel-3B, during which the two Sentinel-3 satellites will fly in tandem, 30 seconds apart, for cross-calibration, the satellites will be moved 140 degrees apart, as requested by the marine user community. This will provide full and frequent global coverage of ocean color and sea surface temperature measurements and the best sampling of the ocean surface topography achievable by altimeter measurements from two Sentinel-3 and one Jason satellites. With this, we will have established the European backbone of an operational global ocean monitoring system and opened a new era for operational oceanography. EUMETSAT Competence Area Manager for Marine Applications Dr Francois Montagner said that during the commissioning of Sentinel-3B, the two Sentinel-3 satellites will be making the same observations 30 seconds apart, which will allow them to perform very accurate cross-calibration, as they did in 2016 for Jason-2 and Jason-3. As a result, the constellation of Sentinel-3A and -3B can really be seen as a single source of measurements. This is crucial for the development of ocean forecasting. Not only will this provide homogenous, unbiased observational inputs to construct the initial conditions required by ocean prediction models, but this will also constitute a unique source for validating the forecasts. EUMETSAT is the European Organization for the Exploitation of Meteorological Satellites is an intergovernmental organization based in Darmstadt, Germany, currently with 30 Member States (Austria, Belgium, Bulgaria, Croatia, Czech Republic, Denmark, Estonia, Finland, France, Germany, Greece, Hungary, Iceland, Ireland, Italy, Latvia, Lithuania, Luxembourg, the Netherlands, Norway, Poland, Portugal, Romania, Slovakia, Slovenia, Spain, Sweden, Switzerland, Turkey and the United Kingdom).